The people behind the Homeschool Freebie of the Day have done it again. 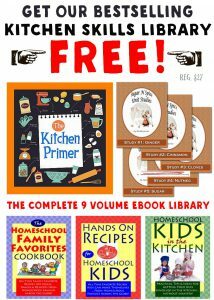 They are offering a free Kitchen Skills Library. Normally they sell this 9 pdf set for $27 but they are giving it away free for anyone that signs up for their newsletter by November 30th. They send out 2 pdfs a week. 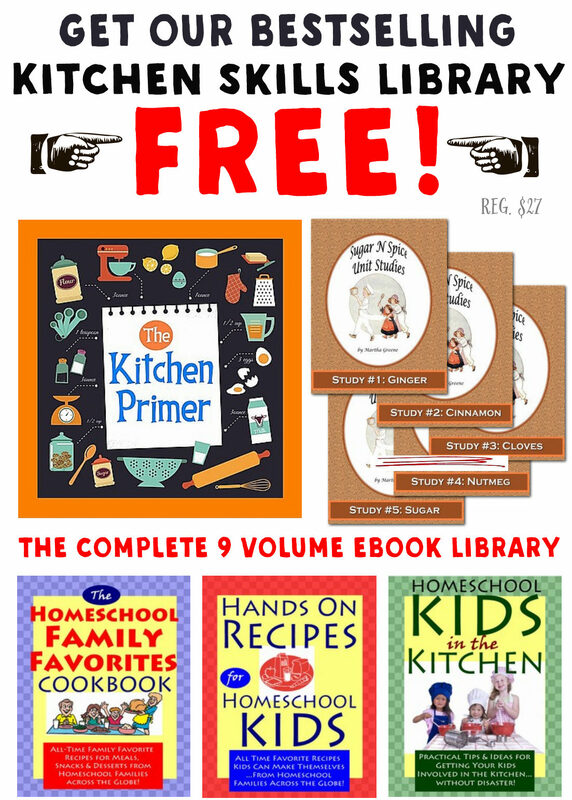 As soon as you confirm your subscription you receive the links for the first two: The Kitchen Primer and the Sugar and Spice Unit Study on Ginger. The first has 162 pages full of beginner tips and suggestions for your children. You can print it out for them to have to read, review, and yes, even cook from. It includes many easy recipes for breakfast, lunch, dinner, snacks and sweets, and ideas for things to do for special days. There are even five tests, if you want to see how well your child retained the information (it also has the answer keys). Then it has some pages to write down your own recipes and some to write down recipes you’ve tried and a place to give a rating. If I were printing this out, I would only print one or two of the additional recipe pages, as you can always print more as needed, and there are about 20 of the same page included in the pdf. The second pdf is short but informative in its 10 pages. It is the unit study on ginger complete with a coloring page, some vocabulary, spelling work, word play, and math questions. It also includes a couple recipes, activity suggestion, and book suggestions. Personally, I am interested in the health benefits of ginger root and the essential oil. So here are a few links for you to go with your study. Well, I guess it would be best if I sent you over to the link to sign up for these free materials. I definitely feel it is worth giving them my email for these free resources (and I don’t even have homeschool aged children any longer ). Jim Erskine has never abused my email inbox and I don’t believe he has ever given my email to anyone either and I’ve been receiving his other newsletter for many many years. Remember this is only free to receive through the end of November and it is coming to an end much quicker than you think. I am struggling to realize that Thanksgiving is actually next week!! !